Shaving giant attacks toxic masculinity, with predictable results. Gillette has provoked an online backlash with a new advert that dares to suggest that traditional boorish male behaviour might not be cool after all. Released on Sunday, the #MeToo-inspired short film is called 'We Believe: The Best Men Can Be' – a smart play on Gillette's familiar tagline, 'The best a man can get'. It wastes no time in showing off the the worst that men can be, with a compilation of actions traditionally associated with toxic masculinity, before going on to showcase examples of how men can take action to be better people and set the right example for the next generation – through respect and inclusivity and by no longer justifying bad behaviour through language such as 'boys will be boys'. The ad has inevitably resulted in a furious online response; the video on YouTube has attracted, at the time of writing, 41,000 likes and 262,000 dislikes, and over on Twitter there's a tidal wave of petulant men's rights activist types on the #Gillette hashtag promising to boycott Gillette forever for daring to ask them to be decent human beings. This is the latest in a growing trend for adverts that challenge outdated views and dare to make a statement – although many of the controversial TV and print ads we've seen so far focus on the female side of things. 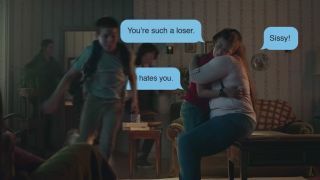 Of course it hasn't escaped people's attention that the ad was directed by a woman: it's the work of Kim Gehrig at Somesuch, who previously directed the 2015 'This Girl Can' campaign for Sport England (watch it below). Online commenters have been quick to single her out and accuse her of destroying Gillette (and, naturally, accuse her of being a 'feminazi'). So why would Gillette go out of its way to provoke this sort of reaction? Gillette's not stupid; it will have known from the outset that exactly this sort of backlash would happen, it'll have done its research and come to the conclusion that the positives of this undeniably thoughtful and provocative campaign would greatly outweigh the negatives. And beyond the advert, Gillette is putting its money where its mouth is, with a commitment to donating $1 million per year to US non-profits dedicated to helping men be their best. And while we're sure that some of the Gillette marketing team are keeping a nervous eye on the ever-rising tally of YouTube dislikes and Twitter rants, there has also been plenty of praise for the campaign. Although let's not go overboard here; others have been a bit more circumspect in their reaction.